Opaa! Food Management provides professional child nutrition management services to k-12 public schools throughout the midwest. Oppa! 's 3,000 employees serve 220 school districts, with a combined enrollment of 220,000 students, in six states! 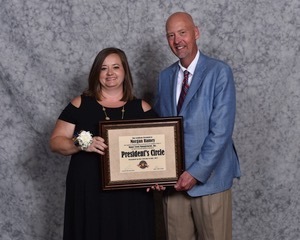 Palmyra R-1 School District is proud to announce that our Food Service Director, Morgan Ramey, was inducted into Oppa! Food Management President's Circle on July 11, 2017. And she didn't stop there, she was also awarded "Director of the Year" for the 2016-2017 school year. We are so very proud of her! Congratulations Morgan!